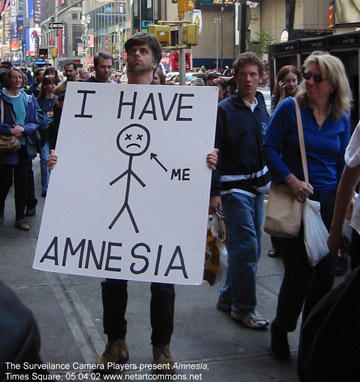 This is an SCP-New York adaption of Denis Beaubois's pioneering performance piece In the Event of Amnesia the City Will Recall. An Australian performance artist and photographer, born in Mauritius in 1970, Beaubois first staged "In the Event of Amnesia" in Sydney over a three-day period in 1996. The following year, the video he made of these first performances won several international awards. 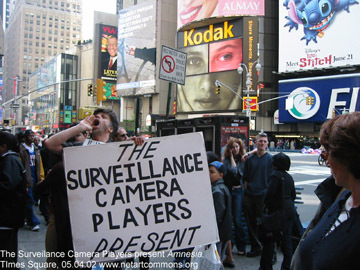 It was in fact through a copy of this video that the SCP-New York first became acquainted with Beaubois and his performances, several of which concern the video surveillance of public places. 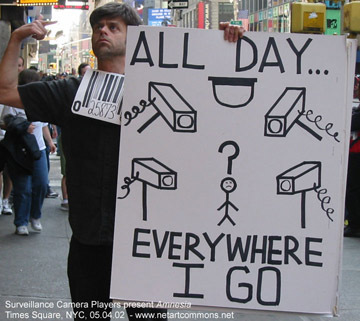 Someone, perhaps an actor pretending to look disoriented and confused, holds up a series of boards or hand-printed signs to a surveillance camera (ideally one operated by the government in one form or another) that say, in order, "I HAVE AMNESIA," "YOU ARE WATCHING ME," "[YOU HAVE BEEN WATCHING ME] ALL DAY, EVERYWHERE I GO," "MAYBE YOU CAN HELP," and "WHO AM I? 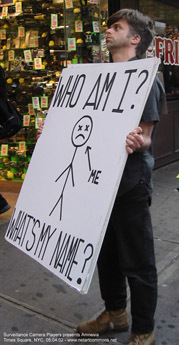 WHAT'S MY NAME?" 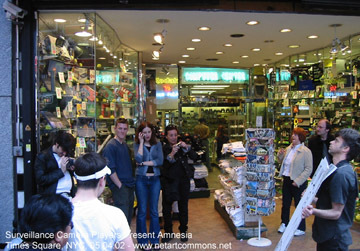 Photographs of performance in front of a Times Square "webcam" on 4 May 2002. 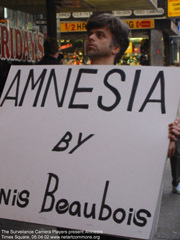 The SCP-New York presents Amnesia by Denis Beaubois. I have amnesia. 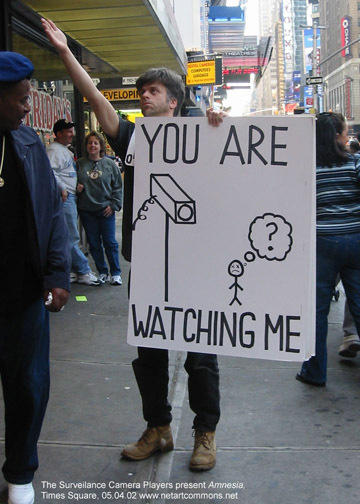 I couldn't help but notice that you are watching me and that you've been watching me all day, everywhere I go. 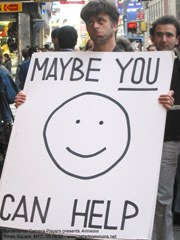 So, maybe you can help me. Who am I? What's my name? People watching the strange spectacle. 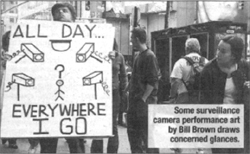 According to The New York Post, this performance is an example of surveillance camera performance art.